Get This Exclusive Card Kit! See these pretty cards? They are the cards for my Affectionately Yours card class on June 20th! We will be making these four cards with matching envelopes AND a matching gift box to put them in! 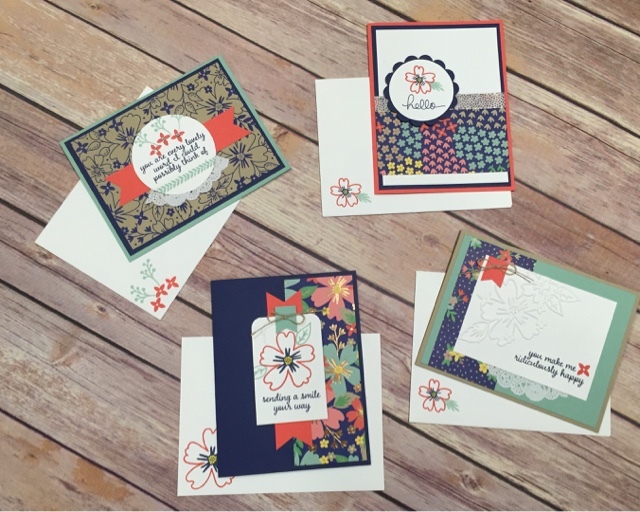 Class fee is $35 and includes a package of Affectionately Yours Specialty Designer Series Paper and the Love & Affection photopolymer stamp set for you to keep (both items are exclusive to the new 2016-2017 Annual catalog that will be released June 1st)! See how pretty the gift box is? Register today to join the fun! BUT WAIT!!! I have another exciting announcement! You can also get all four of these cards for free if you place an order of $35 during the month of May! Yes, you heard that right...FREE! Just place a qualifying order ($35 before tax and shipping) online or in person with me, and I will ship your card kit to you the beginning of June! All pieces will be cut, stamped and ready to assemble! The matching gift box is not included, but I will include instructions if you would like to make it. Great Class and beautiful samples!! It was great meeting you! Good Luck with your 6 month stampin' goals!! Thanks Kathy! Thanks for rooming with me :) Hope to see you again soon!